This is so unbelievable. Thank you for the rescue. My thoughts are with these families. Noted. I saw this earlier, too, and take my hat off to this unlikely and unassuming hero. So glad these young women are free! 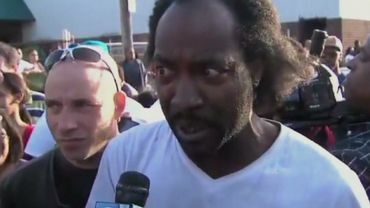 Whether he believes it or not...Charles Ramsey....IS a hero!!! Hooray for him! A perfect example of what it means to be a "good neighbour "
My heart goes out to those three women. Thank you very much Charles Ramsey for saving them. Speaking of "big balls to pull it off", Charles must not be too small in that department. Charles must have changed his stripes; 1997 pled no contest to Domestic Violence charges, 1998 while awaiting sentencing for 1997 arrested again for DV and failure to appear, six months in prison and again 2003 arrested for DV and indicted for DV with prior conviction, another 6 month prison sentence. Perhaps guilt gives on strength to do the right thing. Thanks for saving these girls. He stepped up and did the right thing! Good for him! Not many people would, they would just go on and not pay any attention! so glad he saved those women! More should be like him too! Now when we stop and think about what happened the kidnapper could have been close or came back when the ladies were escaping and it could have been a bad scene! Good thing they got clear and away! Glad it all went well! Bet the neighbors still have been amazed! This man did more positive for racism in this country than anyone has in a long time! He also has a great sense of humor! Thanks goodness he was in the right spot at the right time! Thank God he was able to help those women get free! Three Cheers for Charles Ramsey: Hip hip, hooray, hip hip, hooray, hip hip hooray! The more I read about this story, the more incredible it sounds. The event has been a real consolation in a sea of otherwise worrisome or sad news. Thanks for sharing. Thank God he had the guts to get involved rather than just burying his head in the sand and walking on by. There are still good Humane beings in this world ... just not often featured in the media, not sensational enough I guess. Noted. I particularly enjoyed the video interview with Anderson Cooper. As for Ramsey, good man!